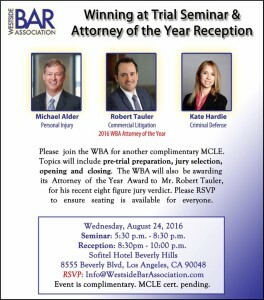 Robert Tauler, managing partner of law firm Tauler Smith LLP, has been named Westside Bar Association’s “Attorney of the Year” for 2016. The Westside Bar Association serves the greater Los Angeles area by connecting young attorneys through continuing education courses and mixers, according to its website. “I am honored to receive this recognition from my peers, and hope to drive our firm and clientele to future success,” said Tauler, a Los Angeles trial attorney specializing in civil trials. The award comes on the heels of a $10 million dollar jury verdict obtained on behalf of a client against a nutritional supplement manufacturer.